UFC 145 Fight Results | MMA Fighting Events Videos Techniques UFC Fight Picks and News. 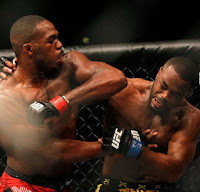 Results: Jon Jones wins via Unanimous Decision. Results: Rory MacDonald wins via TKO (Punches) at 2:20 in the 2nd Round. Results: Ben Rothwell wins via TKO (Punches) at 1:10 in the 1st round. Results: Michael McDonals wins via KO (Punches) at 3:18 in the 1st round. Results: Eddie Yagin wins via split decision. Results: Mark Bocek wins via split decision. Results: Travis brown wins via arm triangle submission at 2:29 in the first round. Results: Matt Brown wins via unanimous decision. Results: Njokuani wins via unanimous decision. Results: Mac Danzig wins via unanimous decision. Results: Keith Wisniewski wins via split decision. UFC 146 goes down May 26th. Stay tuned for the official fight card and main even fight pick and news. 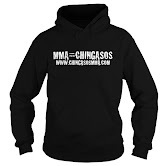 If you're having and MMA event in the Los Angeles area and want to invite Chingasos MMA to be there, feel free to e-mail us at ChingasosMMA@gmail.com.